Our city had it’s first frost last week. I headed to the garden to see the damage. While I don’t have much growing right now, I did notice my wilted jalapeño plant had about 10 good sized peppers still on it. I immediately picked them and looked online for recipe ideas. I knew I had to use a lot quickly so I decided to make some homemade gifts, we made Christmas Red and Green Jalapeño Jelly. If the idea of canning scares you, stop now. 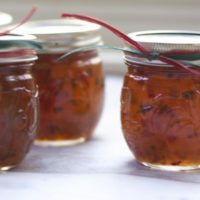 Jams and Jelly’s don’t have to be processed so it is super easy and I am giving you step by step photos to help you along. I used to make jams after season berry picking. Not sure why I stopped. 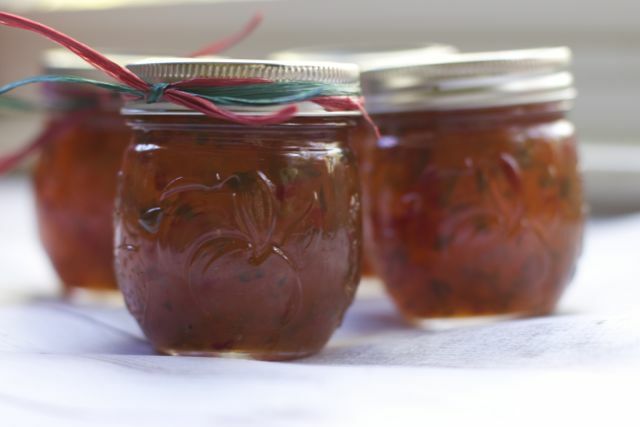 Making jams and jellies is pretty easy and you can preserve the flavors of summer well into the winter as well as gift them to friends. 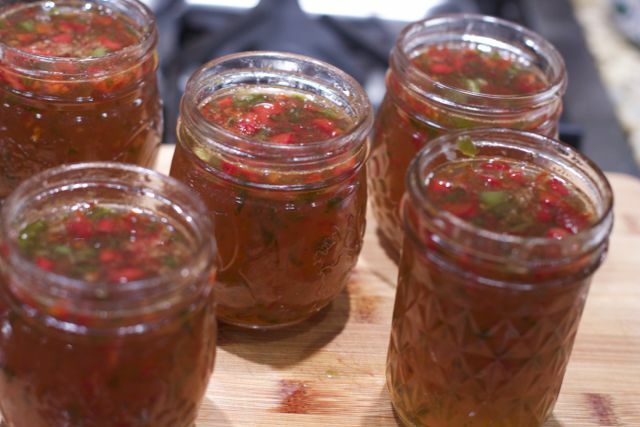 You might be wondering what can you possibly do with jalapeño jelly? 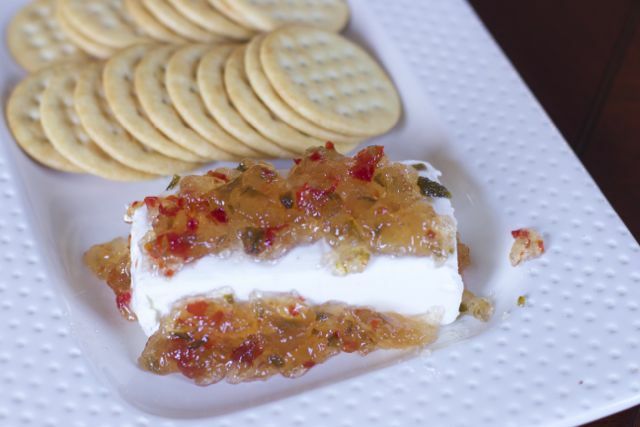 It makes an amazing and quick appetizer poured over a block of cream cheese and served with crackers. 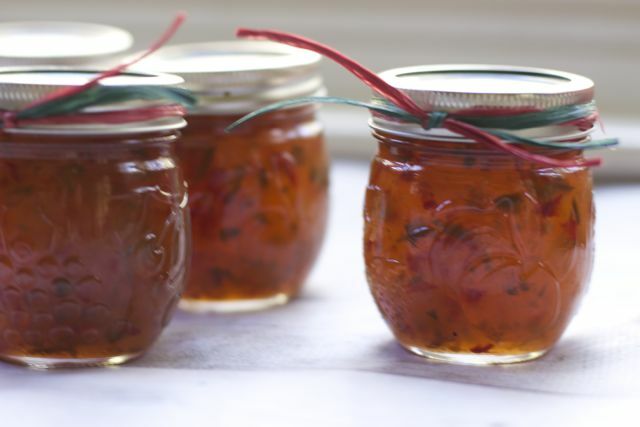 The colors of this jelly are perfect for holiday entertaining. Process all the peppers in the food processor to achieve the small bits you will see through the glass. Using a candy thermometer have the mixture reach 220 degrees. This should take about 3-5 minutes. If you don’t reach this temperature, there is a good chance the jelly won’t set. 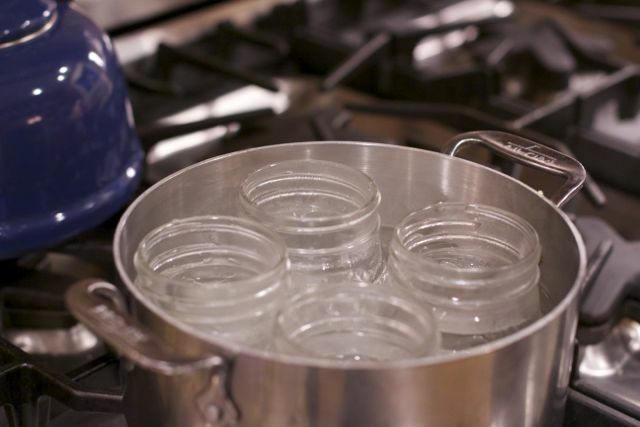 Meanwhile, in a pot of boiling water, sterilize the mason jars and lids. This recipe filled five 8oz mason jars. Fill the jars with the jelly mixture, allowing 1/4 inch space from the top. 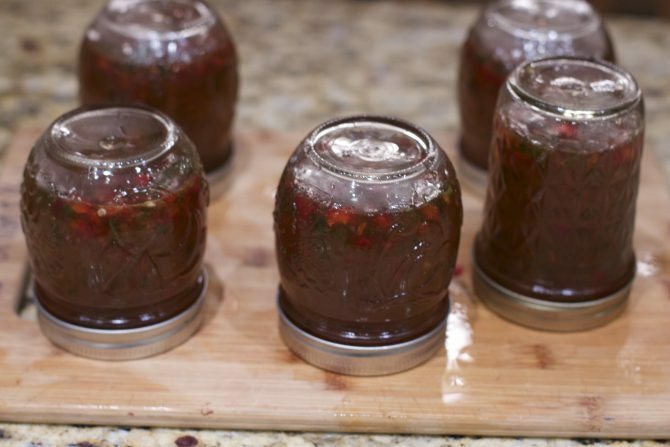 Clean off the rims of the jars and tighten with lids. It was suggested in some notes that you should rotate the jars every 30 minutes for 2 hours so the peppers distribute evenly. While we were sitting at dinner, that glorious pop of the lids went off. The kids were not sure why I was so thrilled. IF you don’t get the pop you will need to reheat the jars and jelly and try again or just refrigerate the jelly immediately. Don’t you just love the colors of this jelly. Perfect for the holidays. Food gifts are always so welcomed, especially ones that can be stored until you are ready to use it. Your friends will be thrilled to have a go-to appetizer in the pantry. 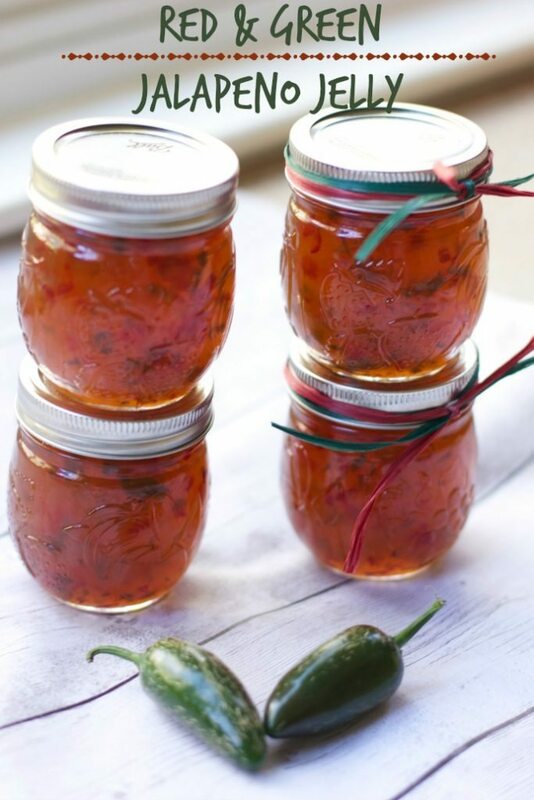 A spicy Christmas jalapeño jelly that is filled with green and red flecks of pepper. Is wonderful over a block of cream cheese served with crackers. Remove stems, veins and most of the seeds of the bell and jalapeño peppers. 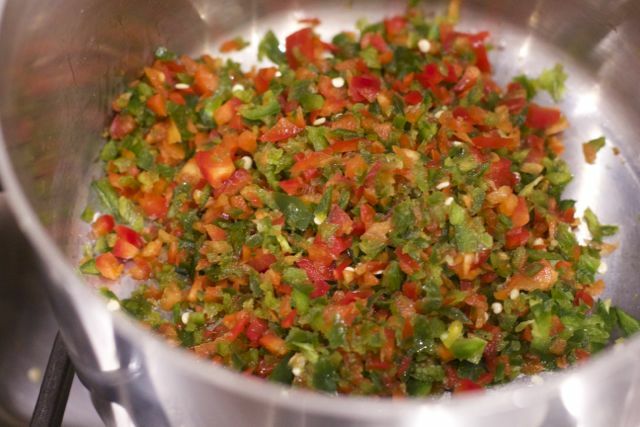 (leaving a few if you prefer a little spicer) Mince peppers in a food processor. 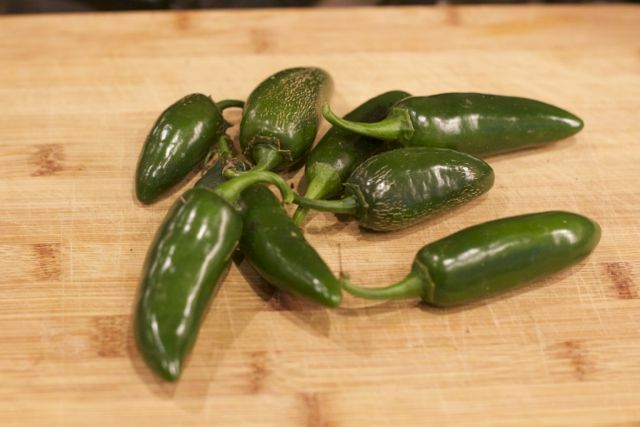 In a 5-quart pot over high heat, combine bell peppers, jalapenos, sugar and vinegar. 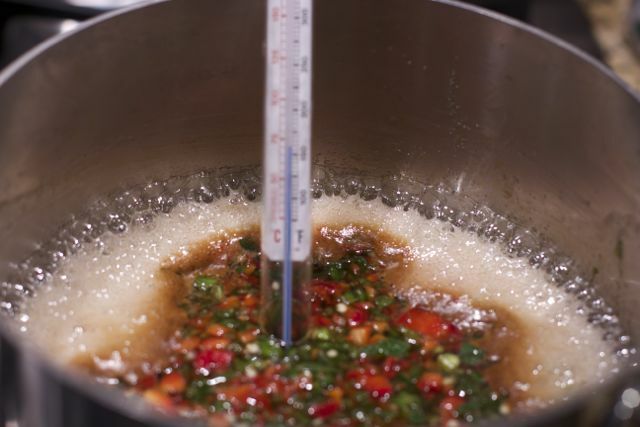 Bring to a rolling boil; boil until it reaches 220* F on a candy thermometer . Remove from heat and cool for 5 minutes. For the first 2 hours, flip the jars over every 30 minutes. This allows for a consistent distribution of the pepper flakes. How have you served jalapeño jelly before? I would love some new ideas. Love the name!! Already made labels or I would have used it! Love the idea of homemade foods as gifts. This is wonderful. Happy holidays! These would make AWESOME gifts! First-off, they’re christmas colored! And they give just that sweet-heat that’s perfect for the cold outside! I can’t wait to make myself a batch! Looks great! I bet this is a hit at all the parties!